Back in the day it was quite common for people in the village to all gather around the village drinking fountain for their daily chat as well as for a swift drink on their way through town. Now with so many germaphobes running around, people are less inclined to drink from outdoor drinking fountains even though they are all certainly clean enough to drink from. European cities have the oldest most beautiful outdoor fountains, most of which you can still from. There’s a gorgeous one in Dubrovnik, Croatia, which attracts hundreds of tourists each day, all lining up to fill their water bottles to the brim. 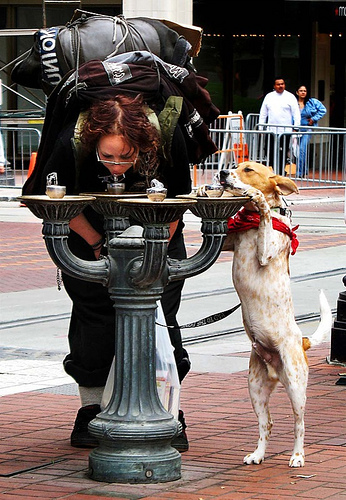 It’s more of a novelty than anything else, but if we had more of the modern outdoor drinking fountains in public areas such as parks and playareas, people would benefit as it would be a way of getting your daily water intake up. As everyone knows, it’s extremely important to drink water every day, up to eight glasses is the recommendation. So with more outdoor drinking water fountains it would make it that little bit easier for everyone to achieve the eight glass recommendation each day. There are many different types of outdoor drinking fountains, the more traditional ones found all over Europe, then there’s the more modern ones which are smaller and easier to keep clean, perfect for parks and outdoor sports fields and basketball courts. If you are looking into getting an outdoor drinking fountain you can view the range from Drinking Water Fountains here or if you simply would like to know more please contact us on contact@drinkingwaterfountains.co.uk or call 0845 500 4455.